Unlike many, Holly's first experience with Occidental College came years before she could even apply to the school. Her love for Oxy started in her early childhood, when she was shown the campus by her grandfather, Dean William Dennis Ward. Eventually, Holly was accepted as an Occidental student. She was excited and grateful to be able to return. Unfortunately, when the War broke out, Holly had to withdraw, relocate to the east coast, and get a job. It was on the east coast that she finished school, got married, and started a family. Eventually, her family moved back to California. There, her daughter, Janet Flakoll, chose to attend Occidental College. The family legacy continued on, and Holly could not have been more proud! When her daughter began school, Dean Ben Culley was serving in the same role that her grandfather had years earlier. Holly, like her grandfather, was incredibly passionate about working with students. She worked many years as a Guidance Counselor. Holly enjoyed encouraging students to finish high school, attend college, and be fearless in the pursuit of their passions. 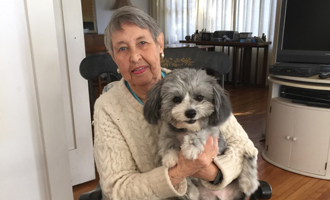 Inspired by her grandparents' love for Occidental students, she eventually decided to add her own Charitable Gift Annuity to the Blee Ward Endowed Scholarship fund that was established in 1919 by Robert and Amanda Blee. Holly's deferred gift had an incredible rate of return even throughout the recent recession. Her financial advisor was astounded, and declared her Charitable Gift Annuity a true win-win scenario. Coming full circle, Holly and her grandparents' legacy will live on, helping Occidental students in perpetuity! The Ben Culley Society was established to recognize Occidental donors that have included the College in their estate plans. It is our pleasure to kindly thank you now for a future gift. If you haven't told us about your estate gift, please contact us. We thank and recognize Holly Ward '47 for her incredible generosity - now and in the future.